THE CHOIR – Segakoor HUIK! Mixed choir HUIK! is a collective which, despite its young age, has established itself as one of the most promising young vocal music collectives in Estonia. 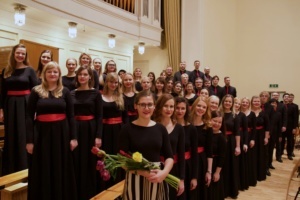 In 2015 the choir won 1st prize at “Tallinn 2015” International Choir Festival, having previously won 1st prize at the Estonian Mixed Choirs Competition “Tuljak”. The choir started singing together in September 2009, with the core consisting of the alumni of Collegium Educationis Revalie who previously sang together as the school’s chamber choir. Mixed choir HUIK! has received praise for its fresh, youthful and energetic sound and versatility in interpretation. The repertoire of Mixed choir HUIK! ranges from renaissance to contemporary, having received most acknowledgement for 20th and 21st century Estonian choral music. The choir has participated in the performance of large-scale works, such as the cantatas “After Golgotha” by Marje Sink and “St. Michaels Sword” by Mart Siimer as well as the world premiere of the contemporary chamber opera “The Other” (2012) by Evelin Seppar. Since the very beginning, the choir has worked closely together with the younger generation of Estonian composers and can often be heard performing pieces by young talents such as Kadri Laanes (b. 1989), Evelin Seppar (b. 1987) and Pärt Uusberg (b. 1987). During their 7th season, HUIK! will be celebrating the 110th anniversary of Estonian composers Eduard Tubin and Eduard Oja by recording their complete works for mixed choirs. Future programmes include music by Ravel, Poulenc, Mahler and Hillborg. The choir will end its season in Italy where it takes part in the 55th International Choral Competition „Sheghizzi“.